Back cover blurb: Where there is family, there is hope ... Vienna, 1939. Nazi police seize Gustav Kleinmann, a Jewish upholsterer and his son, Fritz, and send the pair to Buchenwald in Germany. There began an unimaginable ordeal that saw the pair beaten, starved and forced to build the very concentration camp they were held in. When Gustav was set to be transferred to Auschwitz, a certain death sentence, his son refused to leave his side. Throughout the horrors they witnessed and the suffering they endured, there was one constant that kept them alive: the love between father and son. Based on Gustav's secret diary and meticulous archive research, this book tells their incredible story for the first time - a story of courage and survival unparalleled in the history of the Holocaust. The Boy Who Followed His Father into Auschwitz is a reminder of both the best and the worst of humanity, the strength of family ties, and the power of the human spirit. I have ready many many accounts of the horrors of WWII, both fictional and non. The boy who followed his Father into Auschwitz is up there with the best. Gustav and Fritz Kleinmann are Father and Son living in Vienna prior to WWII with their other family members, Gustav's wife and Fritz's Mother; Tini and Gustav's other children and Fritz's siblings; Edith, Herta and Kurt. The book opens with the Anschuluss; the annexation of Austria in to Nazi Germany on 12 March 1938 and the horrors that followed for so many. The Kleinmann family are torn apart as a result, and Gustav and Fritz find themselves mercifully together in Buchenwald as the rest of the family struggle on under Nazi occupation. Much has been written of those who have survived the Buchenwald, Mauthasen and Auschwitz concentration camps, but I believe this is the only account that I have read to date which covers two remarkable survival stories of the whole period of WWII. The courage and determination that both Gustav and Fritz show is nothing short of amazing. I believe that this book should be on every school's reading list, to ensure that nothing like this ever happens again. This book as an account of that horrific period in history is really powerful, and will stay with me for a long time. 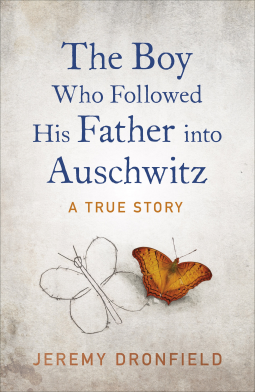 The boy who followed his Father into Auschwitz is available from 24 January 2019.